Delivering a high volume of packages to people who are dispersed across large areas such as colleges, apartment buildings or corporate campuses can be costly and can quickly overwhelm your resources. In these situations, providing a secure and convenient way for recipients to receive packages in a cost-effective manner is a daunting challenge. What if you could provide 24/7 access to packages in a convenient location where people can safely and securely retrieve them? If your organization is struggling with this issue, check out Packcity Intelligent Parcel Lockers from Neopost. These automated electronic locker systems securely store packages for easy recipient retrieval and package returns. They provide a valuable service to residents and consumers and substantial cost savings and reduction of liability to organizations. In some cases, they can even be a profit center. Reduced storage requirements -large storage spaces are no longer necessary. Slimline lockers can be placed in hallways or other easily accessed areas – even outdoors! Customization – lockers can be configured to your needs and incorporate your branding. Security – packages are stored safely until retrieved. Accountability – every drop off and pickup is automatically logged electronically providing 100% chain of custody tracking. Labor reduction – packages are delivered centrally rather than distributed to multiple locations. Reduced handling – eliminates the need for multiple deliveries and re-deliveries. Signatures are captured upon pickup and logged into the system for tracking purposes. Convenience – 24/7 access allows recipients to retrieve packages at a time convenient to the them. Flexibility – recipients are automatically notified by email or text that their package is ready for pickup. All of this is accomplished in three easy steps and returns are just as easy. 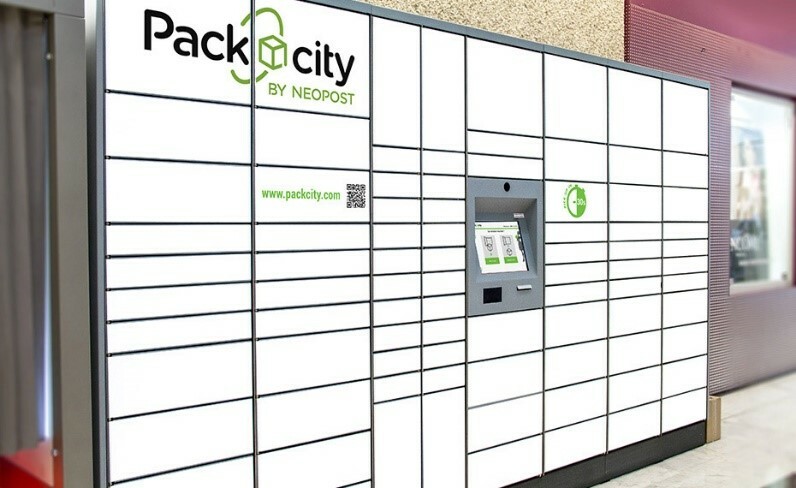 to see Packcity Parcel Lockers in action! Packcity Parcel Lockers are the most convenient click and collect solution for deliveries at residences, retailers, universities, corporations and other locations. They save time for building owners, managers and retailers, while providing a convenient, safe and valuable service to residents and consumers. To explore how Packcity intelligent parcel lockers can benefit your organization, contact Paul Johnson at 303-761-0681 x211 or email pjohnson@cms-colorado.com. In the meantime, you can download a Packcity Parcel Locker brochure here.